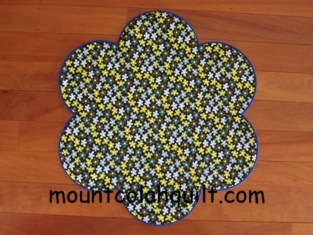 After finishing the Christmas table cloth for my dear friend, Marijke, during my stay in France in 2010, I would like to make a round table runner for myself using the same technique; English Paper Piecing. It was just the right project, for hand sewing, to start at the time when I joined the local ladies at the 'Fat Quarter' sewing group. 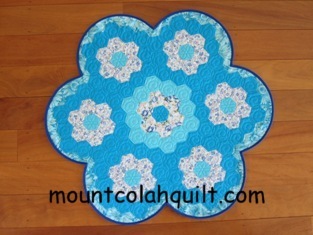 After several stops and starts and 2 years on with my acquisition of the Gammill Statler Stitcher along the way, I have finished this blue hexagon table runner for the round table that I have got at home. 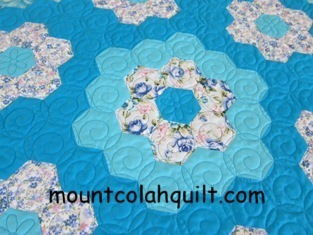 I used 1 1/2 inch size hexagon, pieced the hexagons and appliqued the finished piece on the background fabric by hand. It was a good chance for me to have more practice on custom quilting, so I custom quilted it on my wonderful Gammill Statler Stitcher. The swirl pattern named 'cinnamonroll L107' was by Laurie Thomas. 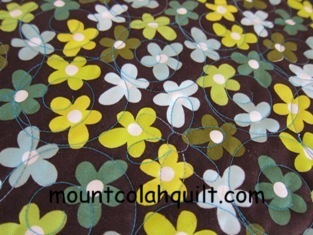 I also experimented with using Creative Studio to divide the pattern (for the little daisy in the centre), and to create a scallop edge, a few tips that I learnt from Karin while visiting her in Stange, Norway. It worked out really well. Thanks, Karin. :-) Although I was managing fine, I also learnt that shallower curves would be easier when it comes to doing the binding....something to keep in mind for the next scallop edge.!! Nevertheless, it was an enjoyable task, overall, during a restful weekend.